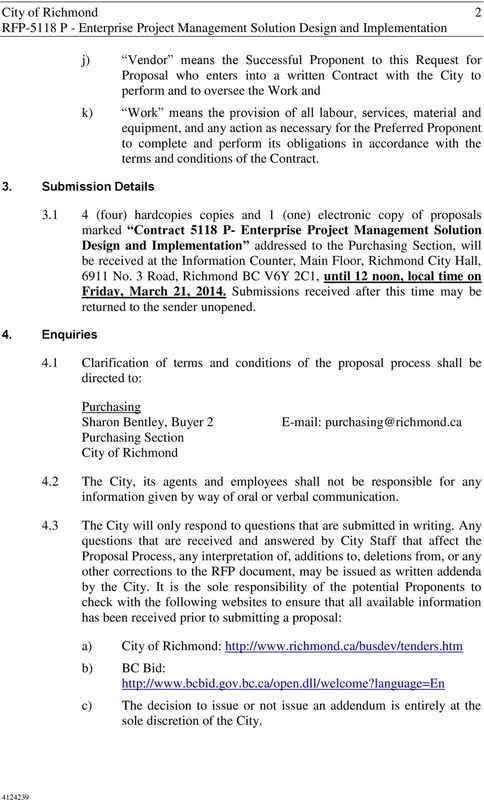 Download "Request for Proposal Business & Financial Services Department"
2 City of Richmond 2 3. Submission Details j) Vendor means the Successful Proponent to this Request for Proposal who enters into a written Contract with the City to perform and to oversee the Work and k) Work means the provision of all labour, services, material and equipment, and any action as necessary for the Preferred Proponent to complete and perform its obligations in accordance with the terms and conditions of the Contract (four) hardcopies copies and 1 (one) electronic copy of proposals marked Contract 5118 P- Enterprise Project Management Solution Design and Implementation addressed to the Purchasing Section, will be received at the Information Counter, Main Floor, Richmond City Hall, 6911 No. 3 Road, Richmond BC V6Y 2C1, until 12 noon, local time on Friday, March 21, Submissions received after this time may be returned to the sender unopened. 4. Enquiries 4.1 Clarification of terms and conditions of the proposal process shall be directed to: Purchasing Sharon Bentley, Buyer 2 Purchasing Section City of Richmond The City, its agents and employees shall not be responsible for any information given by way of oral or verbal communication. 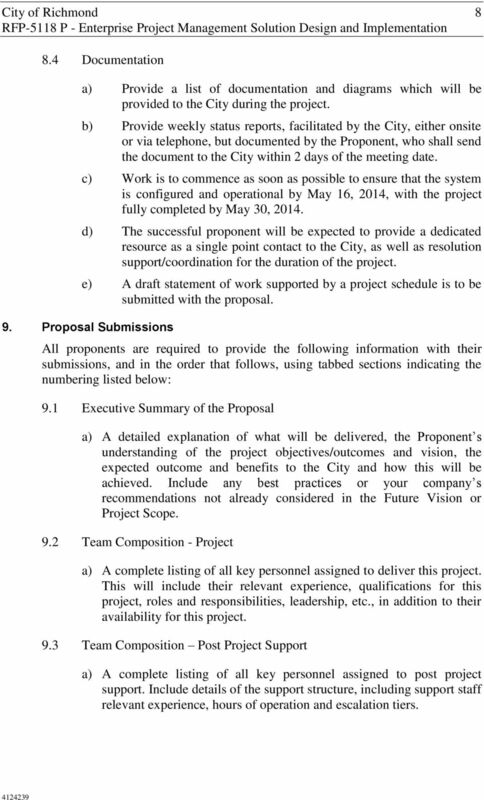 4.3 The City will only respond to questions that are submitted in writing. Any questions that are received and answered by City Staff that affect the Proposal Process, any interpretation of, additions to, deletions from, or any other corrections to the RFP document, may be issued as written addenda by the City. 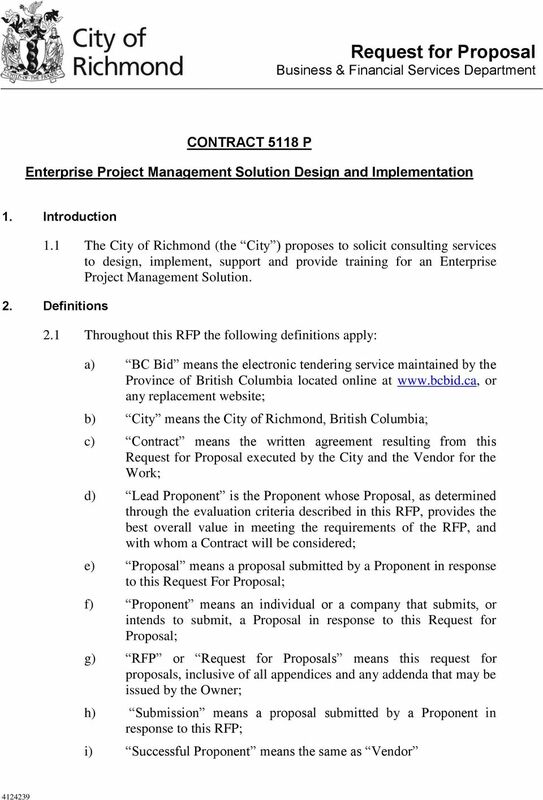 It is the sole responsibility of the potential Proponents to check with the following websites to ensure that all available information has been received prior to submitting a proposal: a) City of Richmond: b) BC Bid: c) The decision to issue or not issue an addendum is entirely at the sole discretion of the City. 3 City of Richmond 3 5. 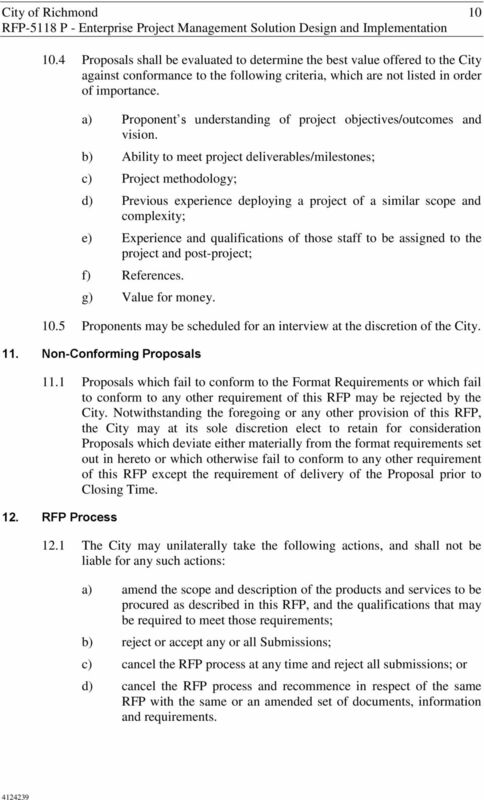 Terms of this RFP d) The deadline for inquires for this RFP is 12 noon, local time on Friday, March 10, The City reserves the right not to respond to inquiries received after this deadline. 5.1 Proposals shall be open for acceptance for 60 (sixty) days after the closing time whether or not any Proposal has been accepted. 5.2 The City reserves the right to cancel this RFP for any reason without any liability to any proponent or to waive irregularities at its own discretion. 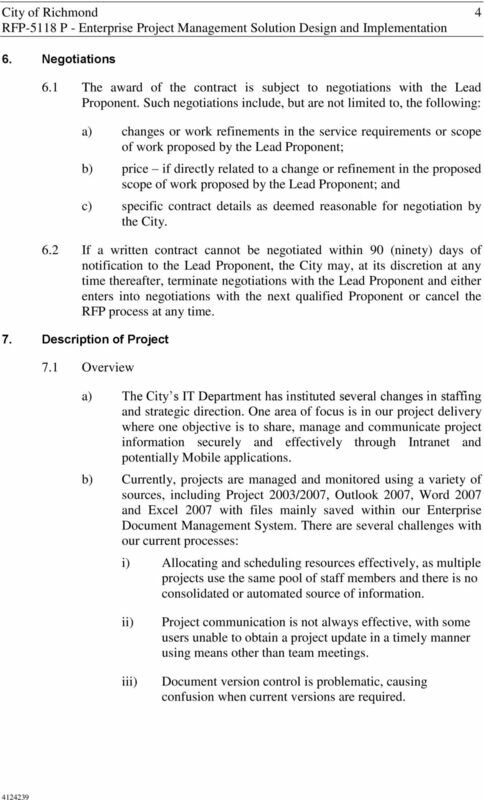 5.3 Proposals may be withdrawn by written notice only provided such notice is received at the office of the City s Purchasing Section prior to the date/time set as the closing time for receiving proposals. 5.4 Except as expressly and specifically permitted in these instructions, no Proponent shall have any claim for any compensation of any kind whatsoever, as a result of participating in the RFP, and by submitting a proposal each proponent shall be deemed to have agreed that it has no claim. 5.5 Proponents are advised that the City will not necessarily accept any Proposal and the City reserves the right to reject any or all Proposals at any time without further explanation or to accept any Proposal considered advantageous to the City. 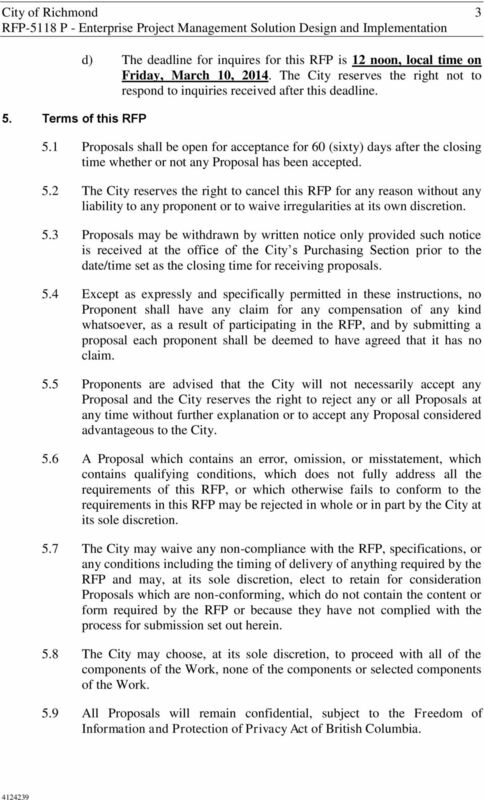 5.6 A Proposal which contains an error, omission, or misstatement, which contains qualifying conditions, which does not fully address all the requirements of this RFP, or which otherwise fails to conform to the requirements in this RFP may be rejected in whole or in part by the City at its sole discretion. 5.7 The City may waive any non-compliance with the RFP, specifications, or any conditions including the timing of delivery of anything required by the RFP and may, at its sole discretion, elect to retain for consideration Proposals which are non-conforming, which do not contain the content or form required by the RFP or because they have not complied with the process for submission set out herein. 5.8 The City may choose, at its sole discretion, to proceed with all of the components of the Work, none of the components or selected components of the Work. 5.9 All Proposals will remain confidential, subject to the Freedom of Information and Protection of Privacy Act of British Columbia. 4 City of Richmond 4 6. Negotiations 6.1 The award of the contract is subject to negotiations with the Lead Proponent. Such negotiations include, but are not limited to, the following: a) changes or work refinements in the service requirements or scope of work proposed by the Lead Proponent; b) price if directly related to a change or refinement in the proposed scope of work proposed by the Lead Proponent; and c) specific contract details as deemed reasonable for negotiation by the City. 6.2 If a written contract cannot be negotiated within 90 (ninety) days of notification to the Lead Proponent, the City may, at its discretion at any time thereafter, terminate negotiations with the Lead Proponent and either enters into negotiations with the next qualified Proponent or cancel the RFP process at any time. 7. 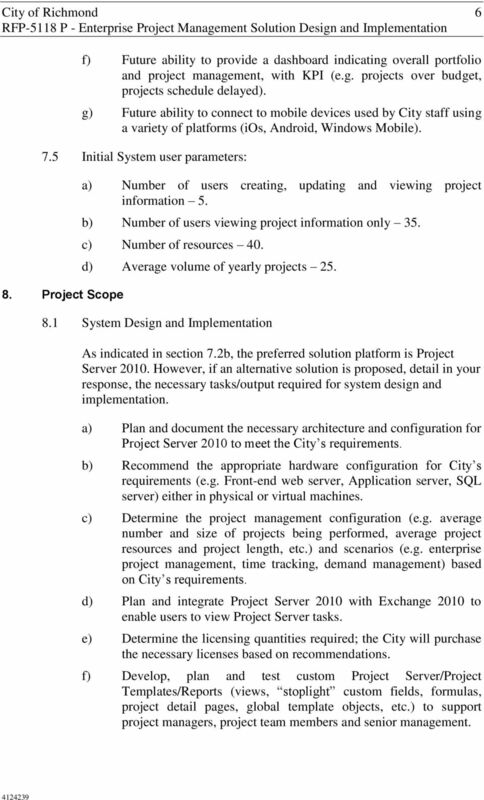 Description of Project 7.1 Overview a) The City s IT Department has instituted several changes in staffing and strategic direction. One area of focus is in our project delivery where one objective is to share, manage and communicate project information securely and effectively through Intranet and potentially Mobile applications. b) Currently, projects are managed and monitored using a variety of sources, including Project 2003/2007, Outlook 2007, Word 2007 and Excel 2007 with files mainly saved within our Enterprise Document Management System. There are several challenges with our current processes: i) Allocating and scheduling resources effectively, as multiple projects use the same pool of staff members and there is no consolidated or automated source of information. ii) iii) Project communication is not always effective, with some users unable to obtain a project update in a timely manner using means other than team meetings. Document version control is problematic, causing confusion when current versions are required. 5 City of Richmond Objectives a) The City is requesting proposals for consulting services to design, implement, support and provide training using an Enterprise Project Management Solution b) Project Server 2010 is the preferred solution platform for an Enterprise Project Management Solution; however, if a proponent believes that an alternative solution would better meet the City s future vision and can provide reasoning and demonstrate expertise and better value for money, the City would be interested in its presentation. 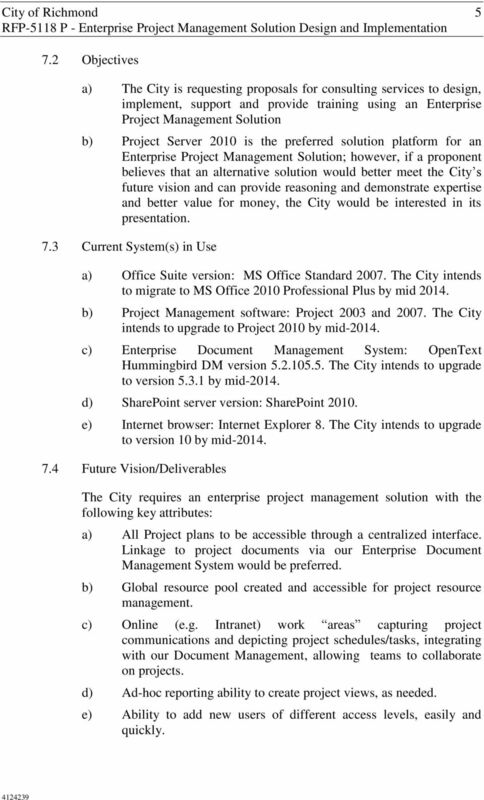 7.3 Current System(s) in Use a) Office Suite version: MS Office Standard The City intends to migrate to MS Office 2010 Professional Plus by mid b) Project Management software: Project 2003 and The City intends to upgrade to Project 2010 by mid c) Enterprise Document Management System: OpenText Hummingbird DM version The City intends to upgrade to version by mid d) SharePoint server version: SharePoint e) Internet browser: Internet Explorer 8. The City intends to upgrade to version 10 by mid Future Vision/Deliverables The City requires an enterprise project management solution with the following key attributes: a) All Project plans to be accessible through a centralized interface. Linkage to project documents via our Enterprise Document Management System would be preferred. b) Global resource pool created and accessible for project resource management. c) Online (e.g. Intranet) work areas capturing project communications and depicting project schedules/tasks, integrating with our Document Management, allowing teams to collaborate on projects. d) Ad-hoc reporting ability to create project views, as needed. e) Ability to add new users of different access levels, easily and quickly. 6 City of Richmond 6 f) Future ability to provide a dashboard indicating overall portfolio and project management, with KPI (e.g. projects over budget, projects schedule delayed). g) Future ability to connect to mobile devices used by City staff using a variety of platforms (ios, Android, Windows Mobile). 7.5 Initial System user parameters: 8. Project Scope a) Number of users creating, updating and viewing project information 5. b) Number of users viewing project information only 35. c) Number of resources 40. d) Average volume of yearly projects System Design and Implementation As indicated in section 7.2b, the preferred solution platform is Project Server However, if an alternative solution is proposed, detail in your response, the necessary tasks/output required for system design and implementation. a) Plan and document the necessary architecture and configuration for Project Server 2010 to meet the City s requirements. b) Recommend the appropriate hardware configuration for City s requirements (e.g. Front-end web server, Application server, SQL server) either in physical or virtual machines. c) Determine the project management configuration (e.g. average number and size of projects being performed, average project resources and project length, etc.) and scenarios (e.g. enterprise project management, time tracking, demand management) based on City s requirements. d) Plan and integrate Project Server 2010 with Exchange 2010 to enable users to view Project Server tasks. e) Determine the licensing quantities required; the City will purchase the necessary licenses based on recommendations. f) Develop, plan and test custom Project Server/Project Templates/Reports (views, stoplight custom fields, formulas, project detail pages, global template objects, etc.) to support project managers, project team members and senior management. 7 City of Richmond 7 g) Configure, implement and test necessary features to support enterprise resource management (including number of concurrent users and user types). h) Perform the necessary tasks to migrate new and existing project content, security, training and ongoing maintenance tasks. i) Recommend and document necessary ongoing maintenance tasks to ensure system health. j) Design and implement Project Proposal process (create, select, plan, manage) into Project Web Access. k) Provide guidance and training to adopt use of Portfolio Management. 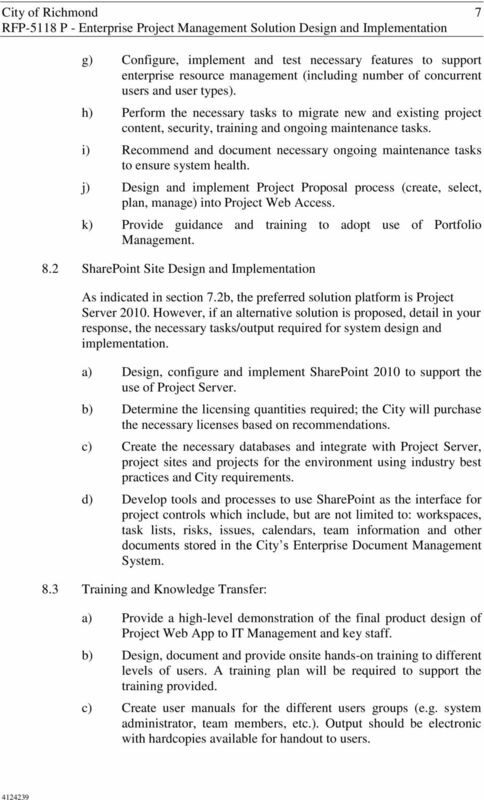 8.2 SharePoint Site Design and Implementation As indicated in section 7.2b, the preferred solution platform is Project Server However, if an alternative solution is proposed, detail in your response, the necessary tasks/output required for system design and implementation. a) Design, configure and implement SharePoint 2010 to support the use of Project Server. b) Determine the licensing quantities required; the City will purchase the necessary licenses based on recommendations. c) Create the necessary databases and integrate with Project Server, project sites and projects for the environment using industry best practices and City requirements. d) Develop tools and processes to use SharePoint as the interface for project controls which include, but are not limited to: workspaces, task lists, risks, issues, calendars, team information and other documents stored in the City s Enterprise Document Management System. 8.3 Training and Knowledge Transfer: a) Provide a high-level demonstration of the final product design of Project Web App to IT Management and key staff. b) Design, document and provide onsite hands-on training to different levels of users. A training plan will be required to support the training provided. c) Create user manuals for the different users groups (e.g. system administrator, team members, etc.). Output should be electronic with hardcopies available for handout to users. 8 City of Richmond Documentation a) Provide a list of documentation and diagrams which will be provided to the City during the project. b) Provide weekly status reports, facilitated by the City, either onsite or via telephone, but documented by the Proponent, who shall send the document to the City within 2 days of the meeting date. c) Work is to commence as soon as possible to ensure that the system is configured and operational by May 16, 2014, with the project fully completed by May 30, d) The successful proponent will be expected to provide a dedicated resource as a single point contact to the City, as well as resolution support/coordination for the duration of the project. e) A draft statement of work supported by a project schedule is to be submitted with the proposal. 9. Proposal Submissions All proponents are required to provide the following information with their submissions, and in the order that follows, using tabbed sections indicating the numbering listed below: 9.1 Executive Summary of the Proposal a) A detailed explanation of what will be delivered, the Proponent s understanding of the project objectives/outcomes and vision, the expected outcome and benefits to the City and how this will be achieved. Include any best practices or your company s recommendations not already considered in the Future Vision or Project Scope. 9.2 Team Composition - Project a) A complete listing of all key personnel assigned to deliver this project. This will include their relevant experience, qualifications for this project, roles and responsibilities, leadership, etc., in addition to their availability for this project. 9.3 Team Composition Post Project Support a) A complete listing of all key personnel assigned to post project support. Include details of the support structure, including support staff relevant experience, hours of operation and escalation tiers. 10 City of Richmond Proposals shall be evaluated to determine the best value offered to the City against conformance to the following criteria, which are not listed in order of importance. a) Proponent s understanding of project objectives/outcomes and vision. b) Ability to meet project deliverables/milestones; c) Project methodology; d) Previous experience deploying a project of a similar scope and complexity; e) Experience and qualifications of those staff to be assigned to the project and post-project; f) References. g) Value for money Proponents may be scheduled for an interview at the discretion of the City. 11. Non-Conforming Proposals 11.1 Proposals which fail to conform to the Format Requirements or which fail to conform to any other requirement of this RFP may be rejected by the City. 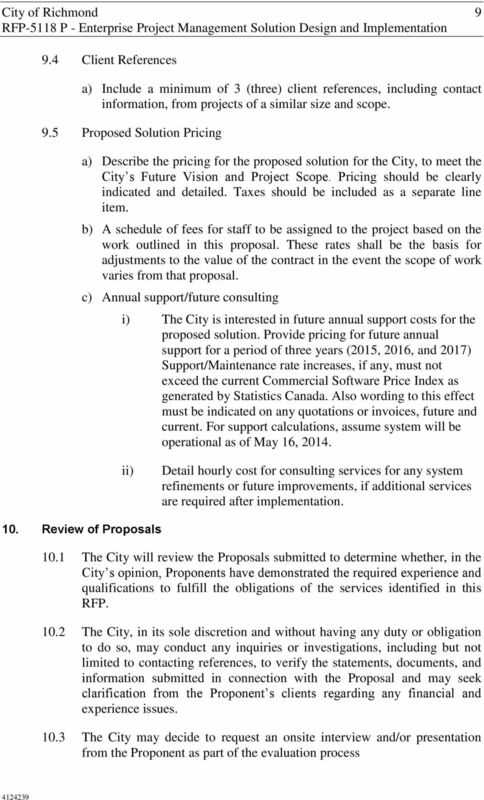 Notwithstanding the foregoing or any other provision of this RFP, the City may at its sole discretion elect to retain for consideration Proposals which deviate either materially from the format requirements set out in hereto or which otherwise fail to conform to any other requirement of this RFP except the requirement of delivery of the Proposal prior to Closing Time. 12. RFP Process 12.1 The City may unilaterally take the following actions, and shall not be liable for any such actions: a) amend the scope and description of the products and services to be procured as described in this RFP, and the qualifications that may be required to meet those requirements; b) reject or accept any or all Submissions; c) cancel the RFP process at any time and reject all submissions; or d) cancel the RFP process and recommence in respect of the same RFP with the same or an amended set of documents, information and requirements. 11 City of Richmond The Proponent acknowledges and agrees that any RFP is in no way whatsoever an offer to enter into an agreement and submission of a Request of Proposal by any Proponent does not in any way whatsoever create a binding agreement. The Proponent acknowledges that the City has no contractual obligations whatsoever arising out of the RFP process. 13. Working Agreement 13.1 The successful proponent will enter into a contract for services with the City based upon the information contained in this RFP and the successful proponent s submission and any modifications thereto Proponents may include their standard terms of engagement with the Proposals. 14. Information Disclaimer 14.1 The City and its directors, officers, employees, agents, consultants and advisors are not liable or responsible for any verbal or written information, or any advice, or any errors or omissions, which may be contained in this RFP or otherwise provided to any Proponent pursuant to this RFP The Proponent shall conduct its own independent investigations and interpretations and shall not rely on the City with respect to information, advice, or documentation provided by the City. 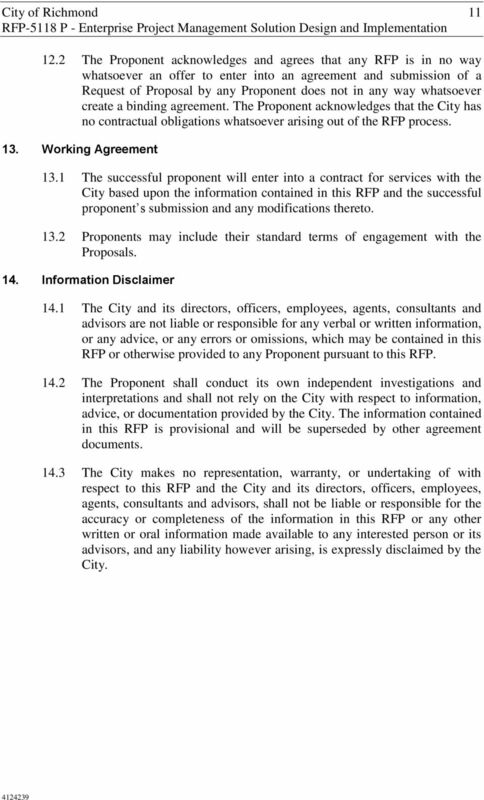 The information contained in this RFP is provisional and will be superseded by other agreement documents The City makes no representation, warranty, or undertaking of with respect to this RFP and the City and its directors, officers, employees, agents, consultants and advisors, shall not be liable or responsible for the accuracy or completeness of the information in this RFP or any other written or oral information made available to any interested person or its advisors, and any liability however arising, is expressly disclaimed by the City. Request for Proposal MPAO Data Center Virtualization Maldives Pension Administration Office (MPAO) is accepting bids for supply, installation, configuration and Support for MPAO Data Center Virtualization. Request For Proposal. Design and Development of Municipal Website. Issue date: May 16, 2016. Submission deadline: on or before June 17, 2016 by 4 p.m.